Color is one of the most important elements in painting. Knowing how to mix colors is the first step in learning about color. 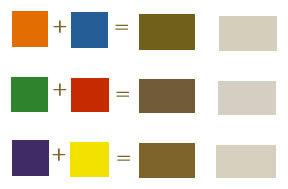 This online color lesson has two parts, which can be ordered together or separately. Besides describing color-mixing, these lessons also teach color theory basics, the history of color in painting, and tips on mixing. Part One covers many aspects of oil and acrylic color mixing, including terms used when describing color, such as primary, secondary, and complementary colors; the color wheel; color harmonies; color and value; and over 40 specific commonly used tube colors, with their characteristics and permanence ratings. Part Two includes mixing colors on the palette and on the canvas (optical mixing techniques); basic color mixing tips; mixing specific colors; the interaction of colors; color exercises; and a history of color in painting and listings of the color palettes of recognized artists up to the 20th century. There is also now a print version of this lesson, which includes the online lesson. There are over 40 illustrations in the color mixing lesson, many photographs and paintings illustrating the various concepts and techniques described, and many links to online examples of well known artists' paintings which illustrate points in the text. These lessons were written by myself, a professional artist, from my painting experience (see my teaching qualifications). This lesson is the seventh fee-based lesson created on my website, to help support the many free lessons offered here. The other fee-based lessons are: Charcoal Drawing, Perspective for Artists, Design Principles, Design Sources, and Painting: Possibilities. The online Color Mixing lesson is in two parts; the cost of both parts is $25.00. To order both parts, please click on its Add to Cart button below, then on the View Cart button below. If you wish to order the printed version, please click on its Add to Cart button below, then on the View Cart button below. You will receive the passwords for this lesson shortly. If you ordered the print version, you will receive it in the mail in a few days. Part One includes color term glossary, color wheel, color harmonies, and a description of over 40 commonly used tube colors, with their characteristics and permanence ratings. To order Part One of the online Color Mixing lesson, please click on its Add to Cart button below, then on the View Cart button above. You will receive your password for this lesson shortly. If you wish to order the printed version of Part One, which includes the online version, please click on its Add to Cart button below, then on the View Cart button above. You will receive the password shortly, and the printed version by mail in a few days. Part Two includes mixing colors on the palette and on the canvas, mixing tips, descriptions of specific tube colors, color interaction exercises, and a history of color in painting. To order the online Part Two of the Color Mixing lesson, please click on its Add to Cart button below, then on the View Cart button above. You will receive your password for this lesson shortly. If you wish to order the printed version of Part Two, which includes the online version, please click on its link below, then on the View Cart button above. You will receive the password for Part Two shortly, and the printed version through the mail in a few days.